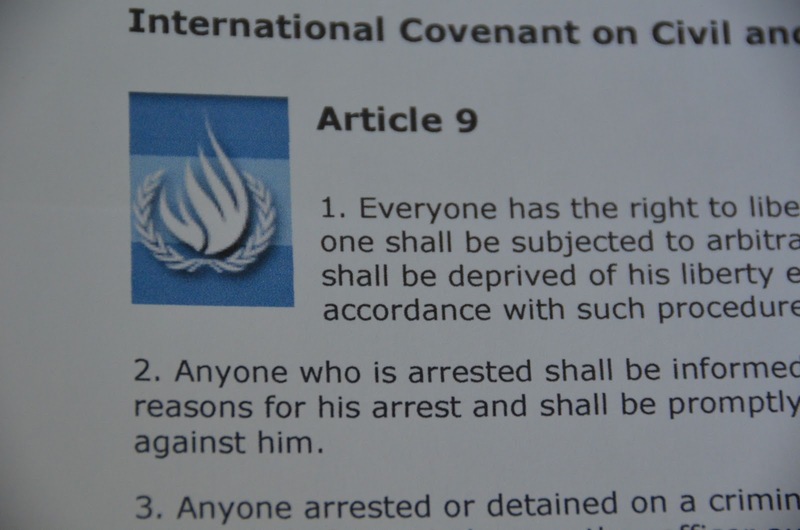 Article 9 to the International Covenant on Civil and Political Rights covers the protections of liberty and security of person. This subject matter includes the right against secret detention, against arbitrary arrest, to be informed of the charges against oneself, to be able to challenge an unlawful detention in a court, and the protection against reprisals. The Human Rights Committee has decided to issue a new general comment on this article, to provide interpretive guidance on what it means. Before releasing a first draft of the general comment, they invited members of the public, including academics and human rights organisations, to submit written statements and participate in a half day hearing and discussion on October 25th. I attended and submitted a presentation on behalf of the organisation I was representing, the Advocates for Human Rights. Copies of all of the statements submitted can be found at the Committee's website. Once adopted, the Committee's statement will become its General Comment 35. It will replace the previous General Comment 8 on Article 9 which was adopted in 1982 and is generally considered out of date and not as substantively detailed as the General Comments that have been issued in recent years on other important articles of the treaty. This was the first time the Committee had invited public input before preparing a draft of a general comment. The next step will be for the assigned Committee member, Mr. Gerald Neumann, to prepare a first draft of the new general comment and distribute it for comment. Usually the process entails two or three additional drafts and review sessions by the Committee, with final adoption probably occurring sometime next year. The general sense seemed to be that the procedure this time of having a half day general discussion before the first draft was issued was useful and that the comments received were very helpful. Two organisations who had indicated an interest were not able to attend, at least one of whom indicated afterward that the expense of attending (including expensive air travel) for an assigned 3 minute speaking slot was not cost justifiable for their organisation. There seemed to be a few other comments about the method of distributing information about the opportunity and the time allotted for each speaker. My comments at the hearing focussed on the drafting style and structure of the General Comment, encouraging the Committee to think differently about how these types of official documents are prepared in the future, given the significant increase of technologies and social media to distribute information. Other speakers focussed on the interaction between armed conflict situations and other domestic human rights situations (humanitarian law vs. human rights law), the special cases of children in detention, mentally disabled in institutions, and other vulnerable groups, states of emergency, extra-territorial application, non-refoulement, and the meaning of the term "arbitrary" as it applies to arrest and detention. 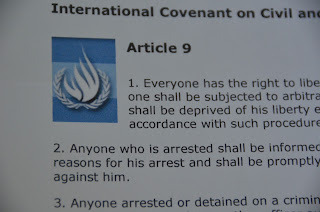 The Human Rights Committee has considered a large number of individual cases over the period since its General Comment 8 was issued in 1982 that involve various aspects of article 9. They will also be weaving these rulings into the content of the new General Comment 35. The Committee indicated that they would welcome additional comments from anyone who missed the opportunity to contribute to the October 25th session, or from those at the session who had additional ideas to submit. There also seemed to be a commitment to a transparent process going forward so that those who are interested in the subject may be able to follow the developments, and comment on the various drafts of the general comment before it becomes final. The hearing was also briefly reported in the UN press release for October 25th.